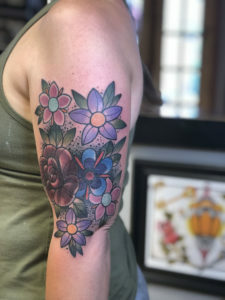 I was curious about a tattoo artists’ professional perspective on moms (and dads) getting tattoos in honor of their children. Yes, my husband is a tattoo artist but, he’s not a mom. 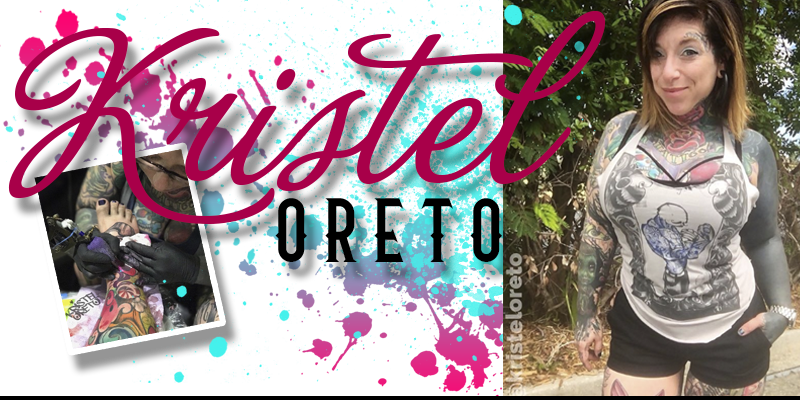 I wanted to have a mom’s opinion and perspective since this is the Tattooed MOMS Club and I instantly thought of Kristel – she is a tattoo artist AND a tattooed mom! 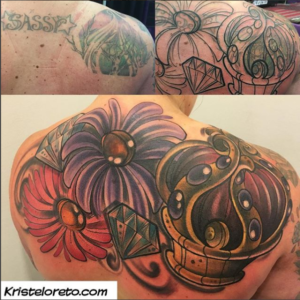 I’ve been a HUGE fan of Kristel’s for years. I have two of her original drawings framed and hanging up in my house and I had her do a custom piece as a gift for my husband. Her artwork is eye-catching, bold, and colorful. I LOVE her style and I am hoping to have the chance to actually get tattooed by her at the Cleveland Tattoo Convention that’s coming up in January. I’ve never met her in person but I’ve followed her long enough to know she is down-to-earth, kind, and truly a real person. So, I held my breath and sent her an email asking her if I could interview her for the blog. I was a total “fan girl” when she replied and said YES! Her life used to be an open book – which is something I really admired her for – but, since there are people in this world that are just not nice she’s a little more private these days. She is still very real, down-to-earth, and kind. When did your career as a tattoo artist begin? My apprenticeship started in 1997 and I began tattooing full time in 1999. I’ve always been obsessed with tattoos. I went to a convention at 16, walked thru the doors and an organic feeling came over me. That’s when I knew it’s where I belong and what I was meant to do. If you could describe your tattoo style in one word, what would it be? What is your favorite part of being a tattoo artist? Changing lives with cover ups. Graffiti, the woods, animals, and traveling. How many tattoos do you think you have done so far in your career? Is there anything you specialize in or enjoy doing the most? Have you ever given a parent a tattoo in honor of their child/ren? What was your favorite one? Yes, I’m working on a sleeve of items for a woman’s kid. We’re turning what she sings to them at bedtime into images. 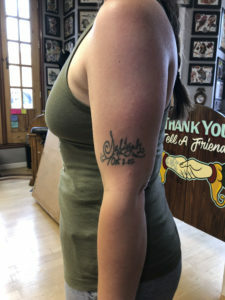 Would you say you have noticed any sort of trend when it comes to parents in general coming in to get tattoos for their kids? Names!!! Which people need to stop doing, things are changing. This has not only happened to me first-hand but, now on a few clients. I did my daughter’s name when she was little; now he uses pronouns and is transitioning and goes by a total different name. 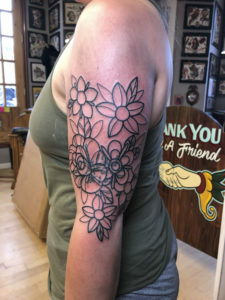 I just covered up a tattoo last week of a woman whom got her daughter’s name when she was little and is now transgender and goes by another name. You never know as they grow up what changes may happen. Maybe stick to images for them, not names. What about when it comes to moms? Is there any certain design that seems to be most popular? Names & dates. Flowers for sure; I always suggest birth month flowers for kids. A lot of cartoons that the kids may watch. Do you think more moms or dads get tattoos in honor of their children? Or do you think it’s pretty even? What would you say the perfect tattoo would be for any parent to get in honor of their child/ren? Birth month flowers. Wait until they are an age to help them decide on image, butterflies/birds, or their favorite animal. I can’t thank Kristel enough for sharing her thoughts with me and allowing me to share them with all of you! 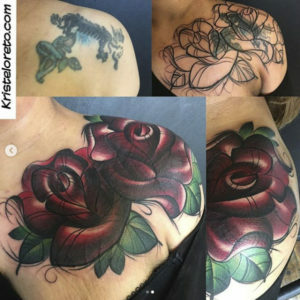 You can find Kristel tattooing at Seven Swords Tattoo Company in Philadelphia, PA or traveling around the country to the many tattoo conventions that happen every year. Snag some of her amazing art, stickers, apparel and other awesomeness from her Etsy shop and be sure to follow her on Instagram – she posts her amazing tattoos, her adorable hairless cats and hairless dog, and of course selfies. All of it is inspiring! All photographs used in this post are © Kristel Oreto and were used with permission.